A few months ago, at the Web 2.0 Summit, Mark Pincus from Zynga talked about some of the ways that online gaming, by connecting people to ideas, could be used for social change. While there weren't many concrete suggestions on how to do that, the idea that online gaming was an area where its full potential was yet to be discovered. 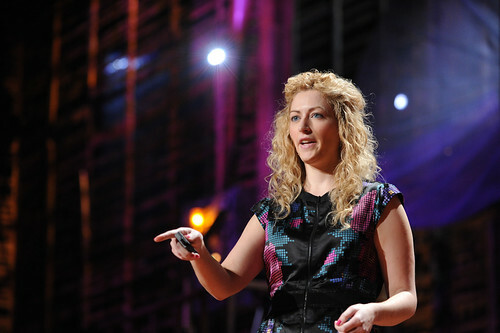 Last week, game designer Jane McGonigal took the stage at the TED Conference to talk about social gaming, and in particular, her new project, EVOKE, launching next week. Despite stereotypes of antisocial gamers who prefer to consume rather than create, most video-gamers are in fact engaged in a highly collaborative effort to exhaustively understand their favorite games. The video-gaming community is, quite simply, engaged in intense and highly successful "collective intelligence." The term "collective intelligence" was coined by French philosopher Pierre Levy in 1994. He argued that, because the Internet allows a rapid, open, and global exchange of data and ideas, the network should "mobilize and coordinate the intelligence, experience, skills, wisdom, and imagination of humanity" in new and unexpected ways. Thanks to the unique nature of digital gaming, gamers may be the world's most literate and practiced community when it comes to developing these new, real-world skills of collaboration and collective intelligence. I'll admit, this whole idea of social gaming for social change is a bit new to me, but I'm extremely interested and want to learn more. Do you have any background, experience, or expertise on online social gaming? Do you agree that games could be used to change the world? Let me know, I'm looking to learn more. And if you're interested, check out EVOKE and let me know what you think of it. I'll be playing along as well. Well, the question is wrong: I don’t know anyone who is positing that *a game* can save the world. What I say is that games will save the world, and I mean it in the same way that someone might say that books or documentary films have saved the world; they haven’t done the whole job, only pieces, but thank heavens for those pieces. I think using online game in a social manner to bring about change is a very innovative idea. Maybe a bit far-fetched at the moment, but I can see how it could work if it's done right... even if it's years before we see it become mainstream. The truth is that there are hundreds of millions of people involved in gaming, and there will be more and more, and most probably nothing and nobody cannot stop that. Games will not make the world a better place. Games are a diversion from reality. People helping people will make the world a better place. Can online games make the world a better place? Hmmm, I dont think so. You just dont have to spend too much time on online games. Gamers are problem solvers by nature. So, when you have millions of people working on a problem, I would say that the odds are that they will solve it. The problems we face today are immanent, the major societies are moving with such inertia that it is very difficult to stop or even slow down, let alone look at the trouble we are in. When I recycle, most of the people I know think I am eccentric, when I talk about the issues of today, I get a polite nodd.. Lets try to give these gamers a chance to contribute to the solution, I have been working on a gaming project http://criticalcollapse.yolasite.com/ whose aim is just that, because the problems are just too big for me, I need help, And I am going to keep on trying because to me this world is just too special not to make every attempt I can to save it, by any means no matter how far fetched. Be good or at least be good at it.